Skype Voice Changer is a funny voice changing application for Skype users. It?s the second core application of AthTek Skype Recorder?s development team. And therefore, the excellent Skype call recording features has been included into Skype Voice Changer. If you have ever played ?Talking Tom? on iPhone or Android smart phone, you would probably know how Skype Voice Changer works. It turns your voice pitch flexibly to be a man or a woman, and you can make funs of your friends with your variegated voice. 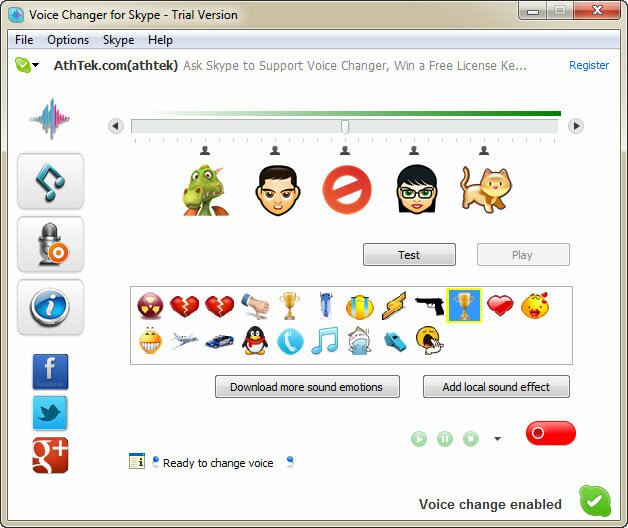 Skype Voice Changer contains three main parts: voice changer, sound emotion player and Skype call recorder. Voice changer: it has 5 preset voice states (Dinosaur, man, your normal voice, woman and cat) for you to quickly pick up the voice pitch. Also you can adjust your voice to new level by dragging the voice changing bar. There is a Test button for you to test and choose the changed voice, and the test results can be saved to your computer as audio files. Sound emotion player: Skype Voice Changer allows users to send funny sound emotions such as Kiss, Heart, Cry etc. Double click on the sound emotion?s icon and the emotion will be sent to your contact immediately. Also you can drag and drop the sound emotion?s icon to the chat window and the contact will be able to receive the sound emotion either. Skype call recorder: it has integrated the excellent Skype recording features of AthTek Skype Recorder, thus it can record Skype calls in high-quality audio formats such as MP3, WMA, OGG and Flac. You can choose to record your normal voice or the changed voice of the Skype call. The free trial of Skype Voice Changer has a few limitations such as less than 1 minute voice changing, less than 1 minute Skype recording and less than 3 emotions each call. You can get rid of all these limitations by registering the full version. Get a license key from our official website now and you would be able to enjoy the unlimited voice changing features on Skype call! VST instrument plug-in for Windows that combines the functions of a sampler and vocoder. Vocotron?s keyboard is divided into two key zones, like on the classic Mellotron and Chamberlin ?samplers? Agile.NET is a .NET Obfuscator and code protection tool for .NET framework. It implements a unique software protection techniques and advanced obfuscation algorithms. PROBILZ - POS STD Edition can help you streamline operations and maximize efficiency,Easy to use, regular updates, customizable and flexible, multi-system capable save time and reduce merchandise control. This site does not contain serial number, crack, keygen Skype Voice Changer serial number : serial number is the simplest type of crack. A serial number(cdkey,product key,etc) is register the program as you may already know. a crack or keygen may contain harmful software. If you cannot find the exact version you want, just give it a try. for more information read .nfo/.txt/.diz file include in zipped file.